Our mission: to help in the transition from drinker of quantity to drinker of quality. Along the way, we'll have some laughs, or someone's catching heck. Prolly me. COCKTAIL KUMITE Round 4, Ernst Vs Negroni! I like to think we'd have been chums. Serve on ice, in a Collins glass. Garnish with a twist of lemon and/or cherry if desired. Stir over ice, strain into a cocktail glass, garnish by breaking the orange peel over the drink, then dropping it in. WHICH COCKTAIL WILL WIN THIS ROUND OF KUMITE?! COCKTAIL KUMITE Round 2, London 77 Vs Pegu Club! On the 02/03/14 Dig Radio live broadcast of the Dr. Radio Show, we went to round 2 of the Cocktail Kumite! [Bracket sheet here] I was home with bronchitis, tweeting gibberish, so Dan mixed both cocktails. Shake over ice, strain into a cocktail glass, do not garnish. Shake over ice, strain into a cocktail glass, do not garnish. You can float the 2 dashes of bitters on top for a lovely presentation. 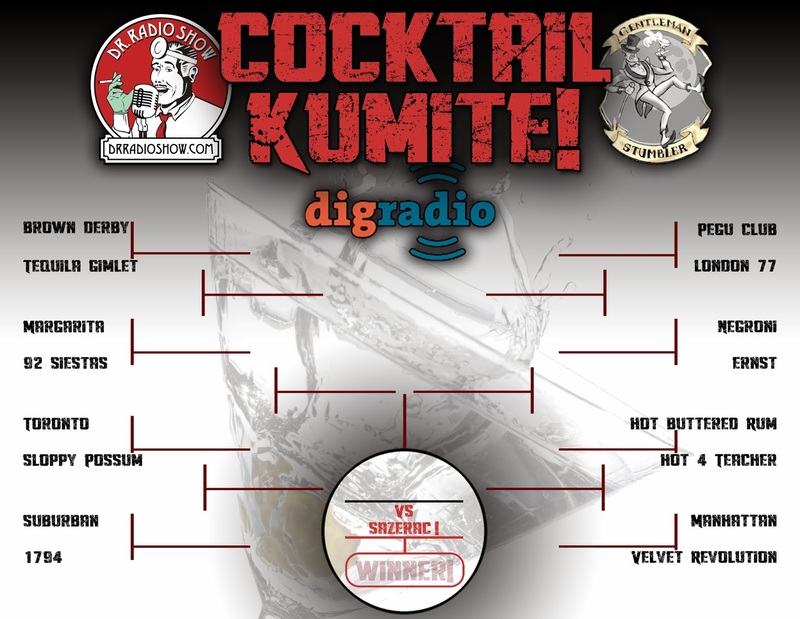 COCKTAIL KUMITE Round 1, Brown Derby Vs Tequila Gimlet! Shake, serve up in a cocktail glass. Shake, serve on the rocks in a Lowball glass. WHICH COCKTAIL WILL WIN THIS ROUND OF THE KUMITE?! Here is your High-Resolution, 300 dpi, COCKTAIL KUMITE Bracket Sheet. Feel free to DOWNLOAD (Right click, Save As) and print it, to help you follow along. Our Dig Radio Boston live broadcast of Dr. Radio Show, is every Monday, 2-4PM. Emergency Cocktail Preparations at Dig Boston. Shake ingredients with ice, strain into chilled cocktail glass. The Tuxedo Cocktail is a lesser known relative of the Martini and perhaps rightfully so. Sherry is a rare ingredient in modern bars. But don't count the Tuxedo out, the use of fino sherry instead of the familiar vermouth, creates a low-key, dry, slightly nutty cocktail, brightened by the citric pepperiness of the orange bitters. The gin's floral, juniper notes come through a little better with the originally prescribed Plymouth, than, say, Bombay or Amsterdam. It is imperative that you do not garnish with a lemon, because it will throw the balance completely off. You could try a twist of orange, but I think grapefruit would be better. Though I've tried neither. Don't worry about adding sherry to your home bar, it may sound fancy, but you can get some for as little as 5 bucks. Just understand, the character of any cocktail is affected by the quality and nuances of the ingredients. Still, I wouldn't spend too much on anything you plan to pour into gin. So what is Sherry, anyway? It is a fortified wine, but not one of the Hobo varietals. It is made with white grapes, in that general Jerez de La Frontera, Andalusia, Spain area we are all so familiar with. Sherry is produced in a variety of dry styles, Fino, being the driest. If drank on its own, sherry is meant to be served cold. Even people who love sherry, acknowledge that it is terrible. The Tuxedo Club. We're probably not allowed in there. This cocktail is featured in the Old Waldorf Bar Days by Albert Stevens Crockett, 1931, but its history is well known. The Tuxedo Cocktail is named after the same country club that the renowned suit of clothing is named after. 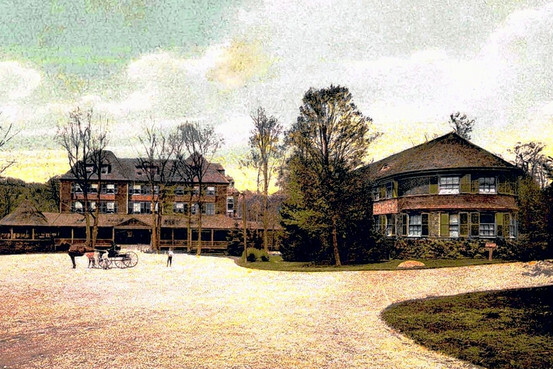 Seems a bunch of punk (rich) kids, staying at the club cut the tails of their dress coats in the late 1800s. And like punk-rock styles do, this one caught on. I'd like to think they were bombed on these cocktails when they got frisky with their dinner attire, but chances are they just told their terrified servants to ruin their wildly expensive clothes. Bottoms up and stay classy. gen·tle·man (j n tl-m n)n.
A well-mannered and considerate man with high standards of proper behavior. A gentleman raises his glass in celebration, never in misery. A gentleman cheers and charms those around him. He never allows the chipper glow of a well slaked thirst to become the impetus for regret or disaster. Thus he always calls a cab.